I’ve been meaning to get back to the Linville Gorge Wilderness for months now, but I’ve been waiting for the local heat index to move from its usual summer setting (Generally Insufferable) to its early autumn range (Mildly Annoying). Last Sunday we finally got a hint of the cool days to come, so it was a perfect time to take up a recent visitor’s suggestion to explore Hawksbill Mountain, a jagged peak on the east rim of the gorge. Hawksbill from about 1.25 miles away — at the Wiseman’s View overlook on the gorge’s west rim. 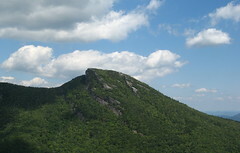 With a summit of just over 4000 feet, Hawksbill is one of the high points of Linville Gorge Wilderness. 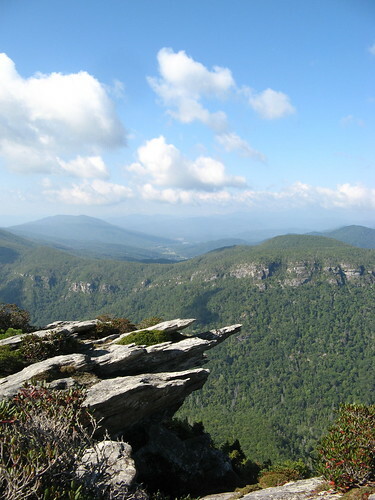 It’s always cooler the higher you go, but most of the hiking at Linville Gorge starts high and dives low on steep, treacherous trails that are tiring enough in sane temperatures. I’m like, sure, if you want to face 95-degree heat and humidity you can swim through because that kind of thing interests you, then head right to the Gorge in the middle of July. Otherwise, wait for more tame temperatures. Left turn at the half-mile point. 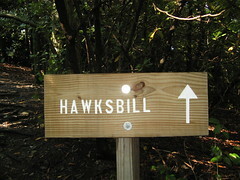 Hawksbill is a training-wheels hike for the Gorge’s terrain. It’s only .8 of a mile to the top, but with 770 feet of ascent (average grade: 18%) you’ll be working up a sweat about a hundred yards in. It’s tree tunnel and roots for the first half mile, then you turn left and start slogging up a steeper, rockier trail. Great views start opening up pretty soon, hinting at the most spectacular views to come. 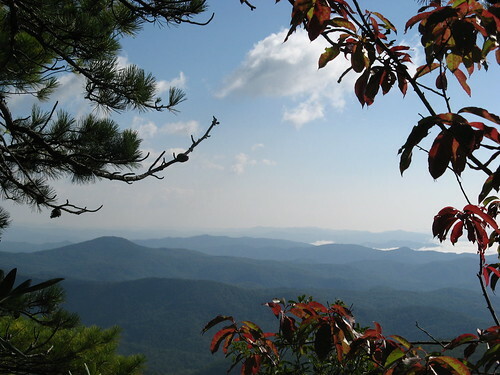 The Blue Ridge from an overlook along the trail. Most of the lower elevations were fogged in, providing that head-above-the-clouds perspective prized by hikers everywhere. Eventually the trail evens out near a large rock beside a flat area that looks like a nice campsite. If you look closely, you’ll see a little trail over to the right of the campsite — this is the trail to the summit. This picture was taken about half-way up. Here’s one view from the top. Yeah, just another mind-blowing panorama under perfect skies and cooling summit breezes. Why would anybody ever want to hike up here? Well, there’s only so much splendor I can stand before my feet get the itch to start hiking again. I headed back down the trail to the junction where it’s a right turn back to the car and a left turn toward the gorge. What the heck, I figured, I’ll try left. 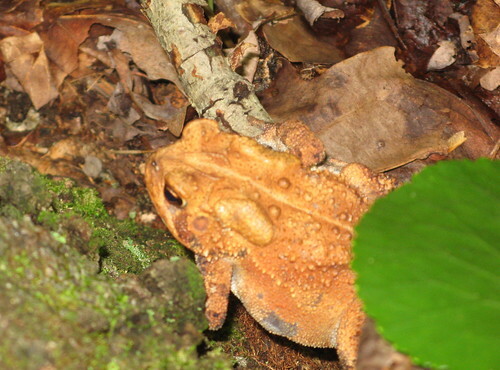 I was hoping the trail might provide an overall view of Hawksbill but it was lost behind the tree cover. The trail doesn’t dive into the gorge; instead it tracks the ridge of the east rim. The hiking’s easy by Linville Gorge standards but there’s still quite a bit of up-and-down. 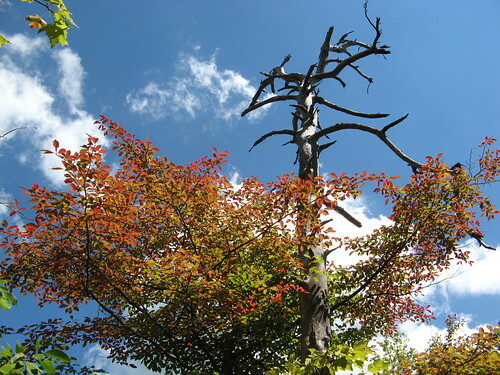 It also passes through a couple campsites that could be fine places to base-camp while exploring the gorge. After about three-quarters of a mile I found this intriguingly titled turn: Devil’s Hole Trail. How could I not turn there? Well, there was the fact that I had no map and figured my GPS unit could get me unlost just in case. After a steep half-mile down into the gorge it occurred to me I’d have to come back all that way, and I had no idea how far away the that diabolical hole might be. Felt like a good time to break for lunch and head back. 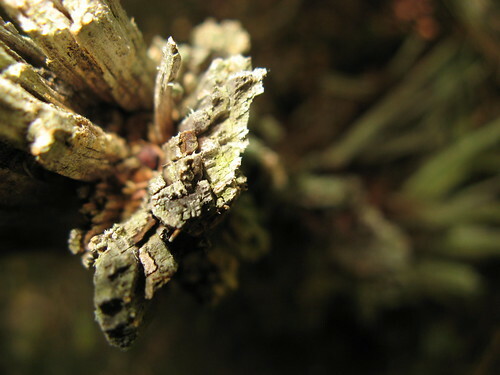 On the way back I stopped at a stump and tried to see if I could come up with anything photogenic. Not sure if I did, truth be told. I did happen across this frog, though. And a few hints of fall color. It’s a designated wilderness: Some trail junctions are signed but many aren’t, and none of the trails have blazes. The official Forest Service map recognizes on a fraction of the actual trails, because hunters, anglers and loggers traveled the gorge for decades before the wilderness was established. The best source for Linville Gorge trail information is Linvillegorge.net. The site’s volunteers have GPS tracks of just about every passable trail in the gorge (and a few impassable ones, I suspect). Folks on the discussion board are authoritative and patient with newbies. Standard advice from the forum’s regulars: think of your hikes in terms of hours, not miles. With all the rocks, roots and precarious climbs, it can be hard to do better than a mile an hour in some areas. The gorge has bears. Camp (and cook) accordingly. My first Linville Gorge hike. Looks like a really cool area, Tom! That gorge is intriguing! Would love to explore that – can’t wait for your post on it! Glad you liked the linvillegorge website. And you are right: Hawksbill is training wheels for other places. The website has downloadable maps…and it is real handy to have those. 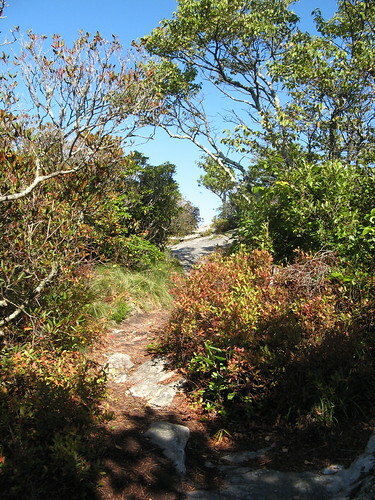 There are almost 100 trails in Linville Gorge as opposed to the Official USFS map which lists only 18. Also you might note the yahoogroup Linvillegorge. Pretty much the same stuff as the website but very useful files and discussion. 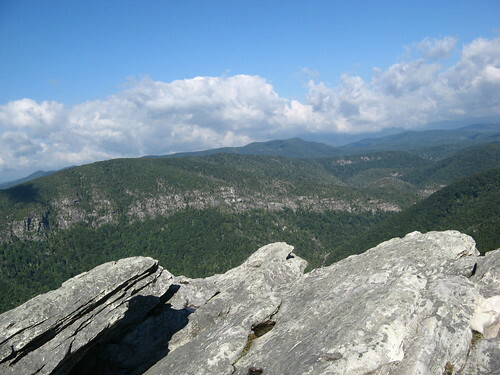 Next time Check out the Ledge trail which you passed by on your way up Hawksbill –its a bit wilder. By the way, have you tried contacting some of the photo/camera companies out there? Given the high regard of your blog, they might give you free state of the art cameras and lenses with which to take the photos.